Neil Beverley, Operations Director of the PMS International Group, was tasked with lowering the operational costs of the business by improving picking performance. His choice of partner was Axiom GB, with its solution to the problem - a new order processing system which introduced ‘wave’ picking of goods. 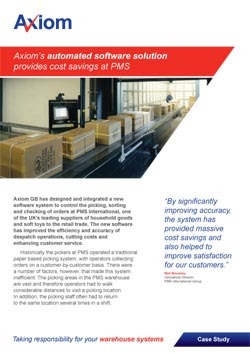 The Axiom system automatically breaks down order components, constantly updating the list of items that are being picked, whilst maintaining the integrity of individual orders. By operating in this way the amount of walking time for operators is reduced and the number of locations visited during a shift is lowered.